Knowing what to look for when test driving a new or used motorcycle isn’t easy, especially if you’re a new rider. What may look and feel “normal” could actually be problematic. Unlike with a car, if a motorcycle wheel is even remotely wobbly, you don’t have the natural safety provided by a steel frame to protect you from serious injury. 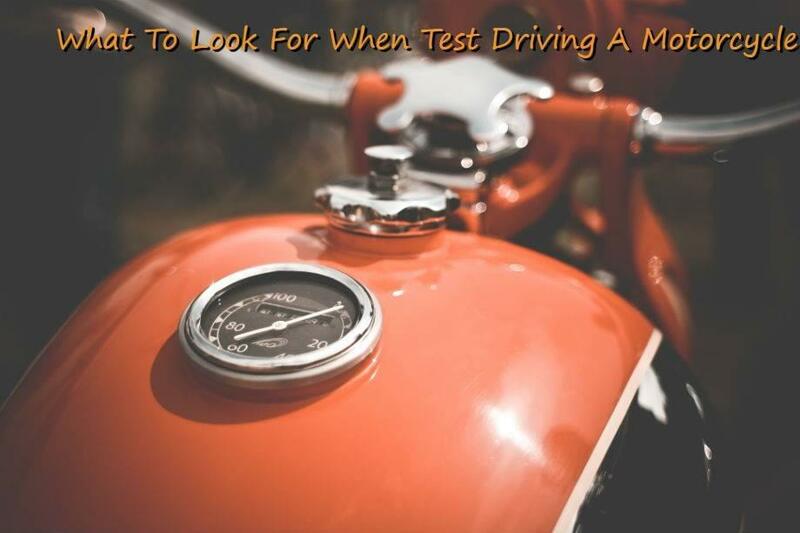 Because test driving a motorcycle is so different from test driving a car, we put together this helpful little list to show you what to look for during a test-drive. 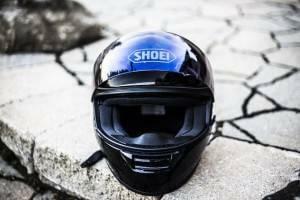 Proper protection is important not only for safety, it also shows you’re a responsible rider. Many dealerships and private sellers won’t allow you to test ride due to safety and insurance concerns. That’s why a thorough visual and mechanical inspection is so critical. In any event, it’s a good idea to check with the seller in advance how they handle test drives and come prepared. Before taking off down the road, carefully inspect the bike. Something as small as a hairline fracture on the frame can pose a potential safety hazard or qualify the bike for a salvage title. If the bike has frame damage, we suggest you walk away. This includes dents, weld tears, kinks, or fractures of any kind. Remove the seat and other easily removable elements that obscure parts of the frame. If necessary, use a flashlight to illuminate portions of the frame that might be too dark to see properly. Crouch at the front and rear of the bike, looking down the lines to ensure everything looks symmetrical cosmetically. If the frame checks out, the next step is to check the bike’s chain. A well-maintained chain lasts a long time, but a neglected chain will cripple a motorcycle and put a rider at risk. A quick visual overview will reveal corrosion, but check the chain’s flexibility, too. Push and pull a section, moving the bike a few inches forward and repeating until you’ve inspected the whole length of the chain. It should move roughly 3/4s of an inch to 1 inch in either direction. Examine the sprockets as well to ensure that their teeth are even, and the tips are not excessively worn down. Now it’s time to examine the battery leads, which you can typically find under the seat. Clean leads generally indicate that the bike has been cared for properly. While the leads won’t reveal battery longevity, a lack of corrosion is a good sign. If the battery leads clean, it’s time to check the tires. Spend some time here making sure that the wear is distributed evenly. Tread depth is incredibly important for traction in wet conditions. Use a quarter to check tread depth by inserting the quarter inside the tread and making sure it doesn’t go below George Washington’s head. Check tire pressure as well. (You may want to bring a pressure gauge with you.) Improperly inflated tires can cause uneven tread patterns. Check the fairings, side covers, small nuts and bolts, and trim. Ensure everything is present and working. Also, check the engine mounts to ensure all bolts are lined up and in place. These little parts may seem unimportant, but they can be expensive to replace. If necessary, get an estimate to fix any missing components. Test the lights and blinkers, and familiarize yourself with the controls and gear shift. Use a flashlight to inspect inside the gas tank for rust or loose sediment. You’ll also want to feel under the engine, the frame, and on top of the exhaust for signs of oil leaks. The first thing you’ll want to do is to grab the front brake. Try to push it down or compress the forks as much as you can. They should greet you with firm resistance, then rebound fully to their starting position. As you compress and decompress the forks, check for oil leakage and surface irregularities. If the bike has a center stand, prop up the motorcycle and turn the handle from lock to lock. Ensure the bar is free of any irregularities or bends, which you’ll be able to identify by the head not moving smoothly in either direction. Can you see properly out of the mirrors? Does your foot easily find the rear brake pedal? Is the clutch easy to engage or disengage? Can you put both feet on the ground? Is the bike easy to mount and dismount? Are you comfortable in the seat? Does the bike feel too heavy to handle? Focus on the ergonomics of the bike. Spend more than just a few minutes sitting on it to find out if it will be comfortable enough after long hauls. It may seem obvious, but one of the most important parts in the process is to ensure the bike fits your body. There are as many body types as there are bikes. If the bike has passed every step, it’s time to get ready to take it out for a spin (assuming the seller allows you). The most important thing to remember now is to take it slow. Don’t rush any aspect of your test drive. This means easing on the accelerator—and the brakes—as well as avoiding any sudden moves. By being cautious, you’ll better experience the bike’s unique quirks and have a more accurate idea of whether you can tolerate them. How does the clutch engage? Does it slip? How does the shifter feel? Is it smooth? Are gears easy to find? Does the bike provide enough power? Does it struggle to reach higher speeds? Is there enough low-end torque to let you get away from stoplights easily? Is there any wobbling of the wheels? Pay attention to how well the brakes work. Try some repeated stops, feeling if the brakes are spongy or smooth. Make sure that there is enough grip to make you feel secure during a panic stop. If there are anti-lock brakes, test them using the rear brake—make sure it doesn’t lock up. If you can feel the brakes pulse on a bike without anti-lock brakes, the rotors may be warped and require replacement. Brakes aren’t the only important aspect. Make sure the bike can turn appropriately. Test the turning to see if the bike feels a little underdamped, which could indicate that the shocks are wearing thin, or that it’s just not a sporty bike. See if the bike pulls to a particular side more so than the other, which may be a warning that the frame is bent. Ensure that no parts scrape as it turns either, which may mean adjustable pegs are set lower than what’s necessary. Suspension: Designed to smooth the ride on rough surfaces, they’re probably worn out if there’s a lot of rattling or squeaking. Not replacing these can compromise the handling of the bike and create potential safety issues. Wheel Bearings: Created to reduce friction and bear load forces, wheel bearings make a loud droning sound when they’re past their prime. Brakes: If there’s some squeaking, it’s probably just normal wear. If there’s a lot of noise—especially after the brakes are warm—it may signal that the pads are ready to be changed or that the rotors are worn down. 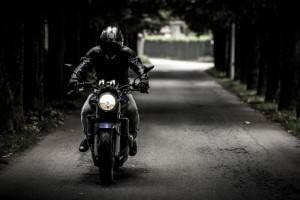 Exhaust: While it may be hard to tell during your first ride, listen for unusual exhaust sounds. Something like a perforated muffler will be unusually loud; rust-caused corrosion can affect the entire exhaust system. After your walkaround and test ride, if you’re still concerned about the vehicle’s mechanical soundness, consider having a professional bike mechanic conduct a comprehensive pre-purchase inspection. Either way, take your time and only move forward once you’re comfortable and confident in your purchase. If you’re having trouble finding the right bike, CarLotz can help. Contact us if you have any questions about your next bike. Our experts will walk you through everything you need to know. Check out The Bike Shop in Midlothian Virginia for the best deals on used motorcycles around Richmond, VA.